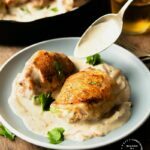 Chicken thighs are nestled in between onions and cooked until golden brown. Then some white wine, crème fraiche and 2 types of mustard are added along with some honey to make a tangy creamy sauce. Place the chicken breasts on a cutting board and trim off any excess skin. Pat dry with paper towels. Season liberally with salt and pepper. Turn them over and season again. Heat 1-2 Tablespoons olive oil in a large 12″ cast iron skillet over medium heat. Add the onions and stir to coat. Season with salt and pepper. Nestle the chicken skin side down around the onions and allow the chicken to brown for approximately 10 minutes. Turn the chicken over, shuffle the onions around and let the other side brown for another 10 minutes. Check the internal temperature and remove the chicken from the pan and to a platter when it reaches 155-160° F.
Add the wine to the onions in the pan scraping up any brown bits from the bottom. Cook until the wine reduces, approximately 2 minutes. Add the garlic, mustards, crème fraiche, sugar and honey. Season with 1/4 tsp of sea salt and pepper to taste. Whisk until smooth, creamy and thick. If serving out of the cast iron skillet, return the chicken to the pan and spoon some of the sauce on top. If serving on a platter, place some of the sauce on the bottom of the platter. Top with the chicken and spoon sauce on top.